In Coleridge's The Rime of the Ancient Mariner, a wizened seadog meets three gallants on their way to a wedding and detains one of them in order to recount his terrifying story. The mariner's tale – out at sea he shot an albatross, causing a terrible curse to fall upon his ship and her crew – is an eerily powerful parable about the reverence a man should have for all God's creatures. Is it possible to update or recast such a masterpiece? Hmm. Until last week I would have said almost certainly not. The chutzpah! But then I read Nick Hayes's The Rime of the Modern Mariner and my doubts fell away. The text might not be so rich as the original – Hayes's nylon nets and polythene bags did not work on this reader quite so effectively as Coleridge's "death-fires" and "witch's oils" – but the illustrations more than make up for this. As a draughtsman, Hayes here places himself firmly in an English romantic tradition that includes Thomas Bewick and Eric Gill, Samuel Palmer and Stanley Spencer. As a result, holding this exquisite book in your hands (his publisher, Jonathan Cape, has spared no expense) feels akin to a sacramental act. In Hayes's Rime, the mariner accosts an office worker in a park as he eats his lunchtime sandwich (having casually discarded the plastic box in which he bought it). The tale he tells is one of environmental disaster. Stranded in the North Pacific Gyre – a swirling and poisonous whirlpool of plastic waste – the mariner comes face to face with the consequences of our unthinking consumption. As in Coleridge's poem, there are spectral animations, and seemingly wrathful gods, but something more prosaic is at work too: the sea is a confetti of bottle tops, and when the mariner hangs the albatross's body around his neck, he sees that it has been strangled by the fine nylon gauze of a fishing net. Back on land, cradled by a bower of ancient trees, his pillow a clump of sweet cicely, the mariner finally understands that the earth, too, has a heartbeat and that we ignore it at our peril. From here on in he will remind everyone he meets of this simple truth. Does our Blackberry-addicted drone listen? He mistakes the mariner for a hobo, tosses him a coin and returns to "a world detached of consequence". On the way back to his shiny office block, he obliviously passes a shop called Humankind, in the window of which hangs a sign. It says "Closing down sale". Back on the park bench, our mariner listens to the melodies of the breeze, and wonders again at mankind's blithe disregard for the planet. The expression on his face combines horror and sagacity quite brilliantly. Those who know their Old Testament will think nervously of the prophets and tingle pleasurably with guilt. This 16th century world map is drawn in the style of a sea chart, with 32 compass directions and navigational lines. But it is not what it seems. Presented in the style of a sea-chart with compass-roses, wind-faces and navigation it was clearly a work of art not intended for use at sea. It is highly unusual in its dual orientation; north of the equator texts and figures are inverted, suggesting that it was specifically designed to be spread out and viewed around a large table. The map is actually created as a work of art for the French King, Henri II (1519-1559), designed to be displayed in his 'cabinet of curiosities' or laid out on a table in his library. The map comes from the renowned Dieppe School of Cartography. It is a large, hand-produced item by Pierre Desceliers, combining knowledge from both French and Portuguese sources -two pioneering nations in the Golden Age of Discovery. One striking feature is how accurate the coastal lines are for a map at this period. Desceliers calls on geographical knowledge to paint a kind of visual encyclopaedia. It is a large piece that is remarkably accurate on details of Europe and America - the discovered world. It is also a work of extraordinary fantasy and speculation such as the notion that Australia is allegedly evident on the edges of the map 50 years before it was officially discovered. Was this good luck or bound within real knowledge? This view of the world is based on a blend of classical sources and direct observation. It is a world-view from time of nautical discovery, as well a beautiful Renaissance work of art. It is a fascinating look into the world of the cartographer and the artist, and amazing to consider the expertise that they had to develop to interpret the world that was being gradually unfurled in the 16th century. Cephalopods such as this cuttlefish can be injured by even short exposure to noise pollution. It's not just dolphins and whales that suffer from the noise of shipping, sonar and oil prospecting. Experiments on squid, cuttlefish and octopuses show that their balancing organs are so badly damaged by sound similar to submarine noise pollution that they become practically immobile. "For the first time we are seeing the effects of noise pollution on species that apparently have no use for sound," says Michel André of the Technical University of Catalonia in Barcelona, Spain. "We were shocked by the magnitude of the trauma," he says. The results of the experiments, in which André's team exposed captive cuttlefish, octopuses and squid to low-frequency sound for 2 hours, seem to confirm that "ear" damage in nine giant squid that unexpectedly washed up on Spanish beaches in 2001 and 2003 was caused by low-frequency sounds from nearby seismic surveys for oil and gas. "At the time, we couldn't prove the cause of the damage," says Angel González of the Institute of Marine Investigation in Vigo, Spain – a member of the team that reported the fate of the giant squid in 2004. But this new paper confirms for the first time that low-frequency sounds induce acoustic trauma in cephalopods." In their recent experiments, André and his colleagues were astonished by extensive damage to the statocyst, a bulbous organ in the head of cephalopods that senses gravity and motion, enabling them to balance in the water and direct where and how fast they swim. Without this organ, cephalopods are practically powerless to move, are unable to hunt, and will become easy prey themselves. Squid, octopuses and cuttlefish were exposed to sweeps of low-frequency noise ranging from 50 to 400 hertz – an "acoustic smog" similar to that created by oil and gas exploration, and shipping. Post-mortems showed that the linings of statocysts from cephalopods not exposed to sound retained the fine hairs that sway as the animals move through water, and are essential to the animals' balance and orientation. Statocysts from the exposed animals, by contrast, had lost huge patches of hair, leaving holes in the membranes of the organ's cells. The insides of the cells had pushed their way through the holes, and mitochondria – the power plants of cells – had suffered extensive damage. By killing and examining the animals at intervals up to four days after the single sound exposure, the team showed that the damage got worse with time, long after the sound had been turned off. André's team also observed the behaviour of the animals during and after exposure. Their first reaction was to try to escape, says André, but they soon stopped moving. The cuttlefish settled on the bed of the tank and the other cephalopods simply floated at a constant depth. The team say the unexpected results could mean that human noise affects the entire web of ocean life. They reinforce the need for regulations to limit noise pollution from marine activities, says André. His team is planning experiments to determine how the damage happens, and, crucially, what levels of sound would be tolerable to the animals. A few weeks ago, I wrote about the ill-advised risks private boats take by venturing into pirate-heavy parts of the Indian Ocean. Every new killing and hostage-taking puts more people at risk, and not for reasons of national security or economic necessity. It’s a big world … why not stay out of “the most dangerous waters on the planet,” unless sailing them is absolutely necessary? A quick response came from my friend Roz Savage, who is about to set off by 21-foot rowboat to cross a section of … the Indian Ocean. This is the fourth leg—out of five—of a seven-year adventure that will take Savage around the globe solo and self-propelled. “The pirates are ranging up to 1,300 miles from the Somali coast, which covers a large swath of the Indian Ocean, but by no means all of it,” she wrote. Fair point. But when Savage departs from Freemantle, Australia, Tuesday, April 12, her destination will be kept hush-hush, out of respect for the pirates. Initially, her goal was to cross the entirety of the Indian Ocean, east to west, landing somewhere along the coast of Africa. To avoid ramped-up pirate activity, the end-point was switched to Mumbai. Now, she won't say where she’s intending to make port. Unlike previous rows, global satellite tracking will not be posting daily locations at her website. Here’s what she wrote to me a week ago: “I had an interesting meeting with the Australian maritime authorities yesterday. A pirate attack was reported further out into the Indian Ocean, closer to their territory, just a day or so ago. So you are quite right to urge caution. Once successful across part of the Indian Ocean, the final leg—New York City to London—is scheduled for 2012. What fuels you when you're all alone out on a big ocean with just your boat and oars? I can’t lie—I find it very challenging being out on the ocean. It’s not my natural habitat. It has its moments of beauty—the stars, the sea creatures, the sunrises and sunsets, and of course the moments of accomplishment—but generally it’s uncomfortable at best, and terrifying at worst. But the ocean has been an incredible teacher. I’ve discovered resources within myself I never would have known existed if I hadn’t taken this leap of faith. What is the single strongest lesson the open ocean offers an individual soul? I am all too aware that I get no special privileges just because I am a human. Out there, I am just another animal, and subject to the laws of nature. When I was rowing my first ocean, the Atlantic, I kept wondering why it was being so mean to me. I was (I thought) a good person doing the right thing for the right reasons. So why was it making my life so difficult? In the rough conditions, all four of my oars broke, I got tendinitis in my shoulders, and the 103 days of the crossing were mostly uncomfortable, and sometimes downright dangerous. Ultimately, I learned not to take it personally. Nature does not make moral judgments—on me individually or on all of us collectively. Our continued existence as a species does not depend on whether we “deserve” to survive in a moral sense, but rather a practical, scientific sense. Given what we have done to our only planet, is human life sustainable in the long term? Time will tell, but big brains and opposing thumbs won’t help us much if we have poisoned our ecosphere beyond what our bodies can adapt to. 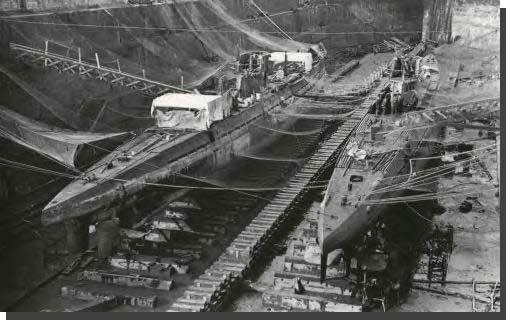 The Dutch navy says it has discovered the sunken wreck of a German World War I submarine off the island of Terschelling and will designate it a war grave. The Defense Ministry says the wreck of the SM U-106 is lying on the seabed 40 meters (130 feet) underwater and 65 kilometers (40 miles) north of Terschelling, an island in the Wadden Sea off the northern Netherlands. The submarine was first discovered in October 2009 during hydrographical research by HNLMS Snellius, but the find was only announced 16th March after the Dutch Defense Ministry authorities confirmed its identity with German authorities and inform descendants of the crew. "This type of discovery almost always happens by chance," said Jouke Spoelstra, the expedition leader of the identification project. "Some ten years ago, one of the ships of the Hydrographic Service passed by the exact same location, but then the boat was under a layer of sand. The submarine will be left where it is and will be made an official war grave. A commemoration ceremony could be held at sea, but that will only be done on the investigation of the families." Following the discovery, the mine hunter HNLMS Maassluis searched the area in December 2009, using a wire-guide underwater camera. The investigation confirmed that the shipwreck was a submarine. 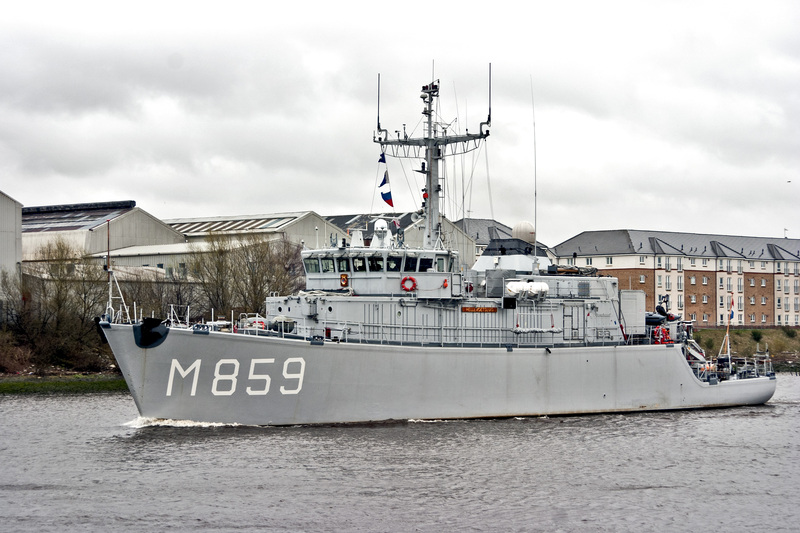 Two months later, the HNLMS Hellevoetsluis launched the underwater robot Remus to further investigate the wreck. Divers from the Navy's Diving and Explosive Ordnance Disposal Group were able to recover a cylindrical air tank that was used by WWI submarines to dive and surface. A copper plate bearing the serial and the submarine numbers on the air tank clearly identified the wreck as SM U-106. 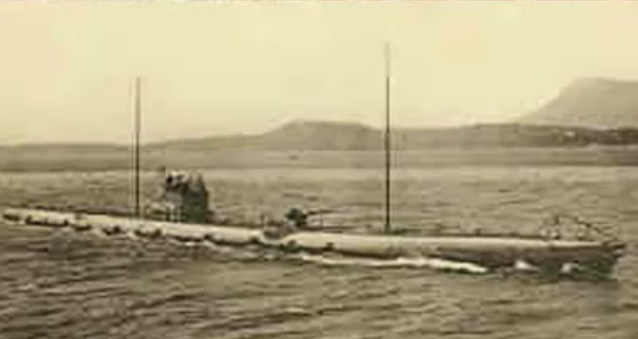 The Dutch navy initially believed the wreck was a Dutch submarine, O-13, that went missing during World War II in June 1940, but divers and remote cameras later confirmed it was the SM U-106. 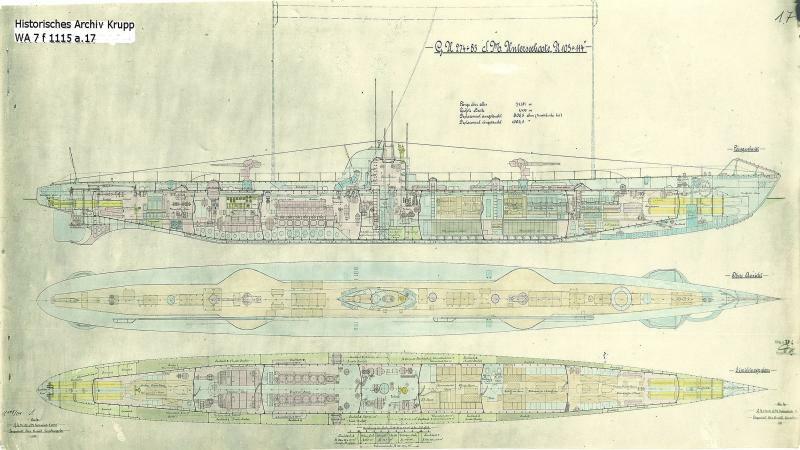 SM U-106 was built by the Germaniawerft in Kiel, Germany. The 71-meter (233 ft) and 946 ton (submerged) submarine could achieve a speed of 16.8 knots while on the surface and 9.1 knots under water. It did have a surface range of about 11,200 miles (18,029 km), and 56 miles (90 km) while submerged. A brass plaque on an air bottle from a recently discovered First World War German submarine as it is displayed in the North Sea, north of the Dutch island of Terschelling. The sub sank on 7 October 1917 after hitting a mine on its maiden voyage (the SM U-106 was commissioned on 28 July 1917 under the command of Kapitänleutnant Hans Hufnagel and paticipated in one wartime patrol starting on 2 September 1917), with the loss of all 41 crew. During its first voyage, the submarine had torpedoed two British ships : during the first Battle of the Atlantic, it was credited with the sinking of HMS Contest, an Acasta-class destroyer, and damaging “City of Lincoln,” a 5,867-ton steamer, in the Western approaches. Normally the German U-boats would be guided through the mines by a surface ship capable of detecting the explosives, Dutch navy spokesman Lt. Col. Robin Middel told The Associated Press, but on its ill-fated voyage the sub ran into a newly laid British mine. The sub "was to make a rendezvous with that ship, but the ship never found the submarine and nobody had ever heard anything more from it," Middel said. Inclusion of this data into the team's modeling was one of the factors causing them to retrench on the 2013 date, which raised eyebrows - and subsequently some criticism - when it emerged at a US science meeting four years ago. But one peer - Dr Walt Meier from the US National Snow and Ice Data Center in Boulder, Colorado - said the behavior of sea ice becomes less predictable as it gets thinner. "But 2019 is only eight years away; there's been modeling showing that [likely dates are around] 2040/50, and I'd still lean towards that. But some researchers believe 2010's melt was equally as notable as 2007's, given weather conditions that were favorable to the durability of ice. The Russian and Canadian governments, for example, are looking to the opportunities for mineral exploitation that will arise; while the US military has expressed concern about losing a natural defense around the country's northern border for part of the year. "Basically, we're trying to make policymakers and people who need to know about climate change in the Arctic realize there is a chance that summer sea ice could be gone by the end of the decade. "For the national interest, the defense interest, I think it's important to realize that 2040 is not a crystal ball prediction." “Albatrosses extract energy from winds to soar, as seen in these diagrammatic views from the side (left) and from overhead (right). Above a wave, winds blow progressively faster the higher you ascend. As albatrosses rise at an angle from a relatively windless wave trough, they cross a boundary into an area of brisk winds. They abruptly gain airspeed, giving them a burst of kinetic energy that allows them to climb to heights of 10 to 15 meters above the ocean. Then they bank downwind and swoop down into another wave trough, adding airspeed as they cross the boundary in reverse, and begin the cycle again. After the birds gain height, they can proceed in any of three directions. They can turn downwind, getting a boost from the tailwind (orange). They can swoop down into the same wave trough, flying parallel to the waves and perpendicular to the wind (green). An oceanographer may be offering the best explanation yet of one of the great mysteries of flight--how albatrosses fly such vast distances, even around the world, almost without flapping their wings. The answer, says Philip L. Richardson of the Woods Hole Oceanographic Institution (WHOI), lies in a concept called dynamic soaring, in which the large bird utilizes the power of above-ocean wind shear while tacking like an airborne sailboat. Albatrosses are consummate fliers, spending the majority of their long lives soaring above the ocean, rarely resting or using their wings. By the age of 50, an albatross has typically flown at least 1.5 million miles. 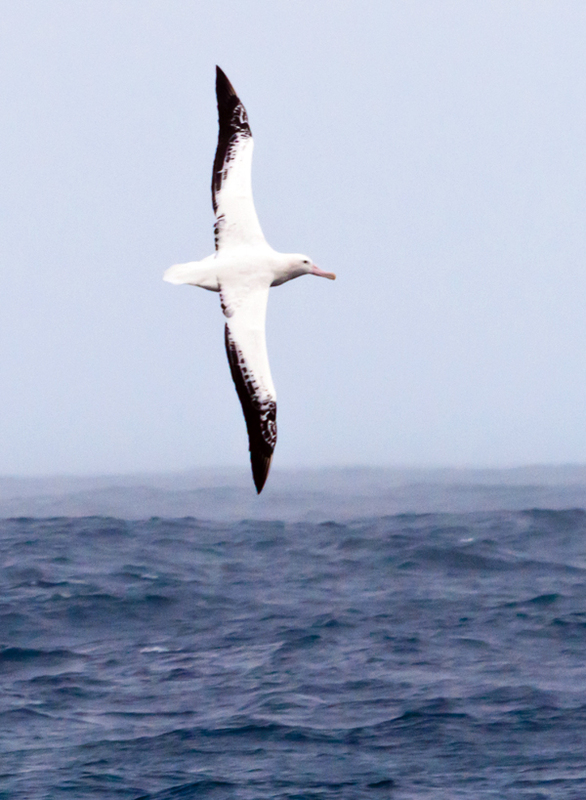 “I have a simple model that explains the basic physics of what albatrosses do,” says Richardson, a scientist emeritus at WHOI, who, in addition to his primary career in studying ocean currents, has also piloted gliders. The key, he says, is the bird’s ability to balance the kinetic energy gained in soaring with the energy lost from drag. He explains that above ocean waves, winds blow in layers—near the surface, air-sea friction slows lower-level winds while winds blow faster at higher levels. As an albatross climbs from a wave trough, it is met by progressively faster winds that provide a burst of energy, increasing its speed significantly and carrying it as high as 10 to 15 meters. Richardson was particularly intrigued by how the birds could be doing this while flying into the wind, something he had observed from a ship in the South Atlantic Ocean. “It’s been a mystery how they fly this way,” he said. Drawing on previous theories by Nobel laureate physicist Lord Rayleigh in 1883 and later by British scientist Colin Pennycuick, Richardson devised a model that accounts for the albatross’s dramatic, accelerating climbs and dives and elegant twists and turns, incorporating winds and waves. It also explained the bird’s ability to seemingly fly upwind. To travel upwind, a sailor tacks into the wind. Richardson realized that albatrosses do the same thing. “They are using wind shear both ways,” he says. Using the model, he estimates that it takes a minimum wind speed of about 7 knots for an albatross to soar. The wingspans of wandering albatrosses can reach 12 feet, but they rarely flap their wings. Instead they take advantage of winds and waves to remain aloft without expending energy. In further describing this dynamic soaring, Richardson says what he has done is to refine previous models. 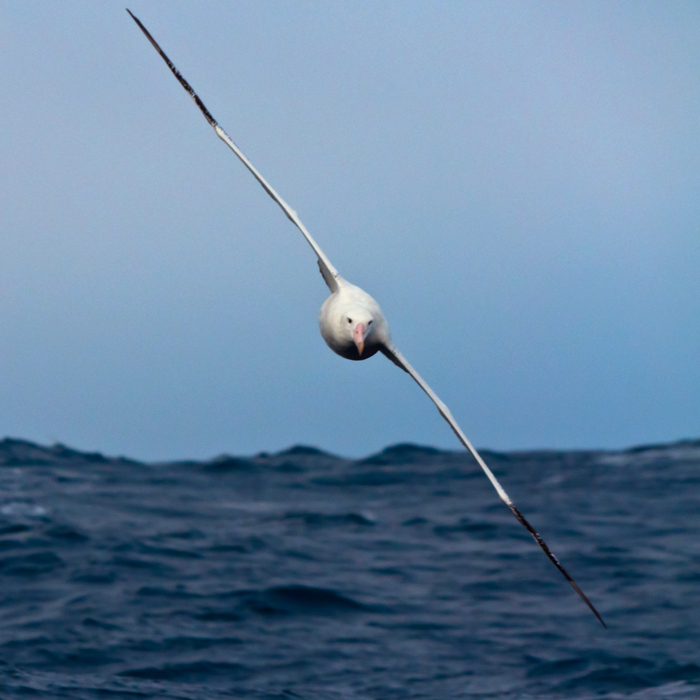 While calculating that dynamic soaring accounts for the vast majority of energy for albatross flight, he says the remaining 10 to 20 percent comes from updrafts. “It’s a simple model that explains what albatrosses do,” he said. Beyond that, Richardson suggests that understanding albatross flight might help increase the speeds of radio-controlled gliders, or some day enable fleets of such gliders to be dispatched to measure oceans, he said.